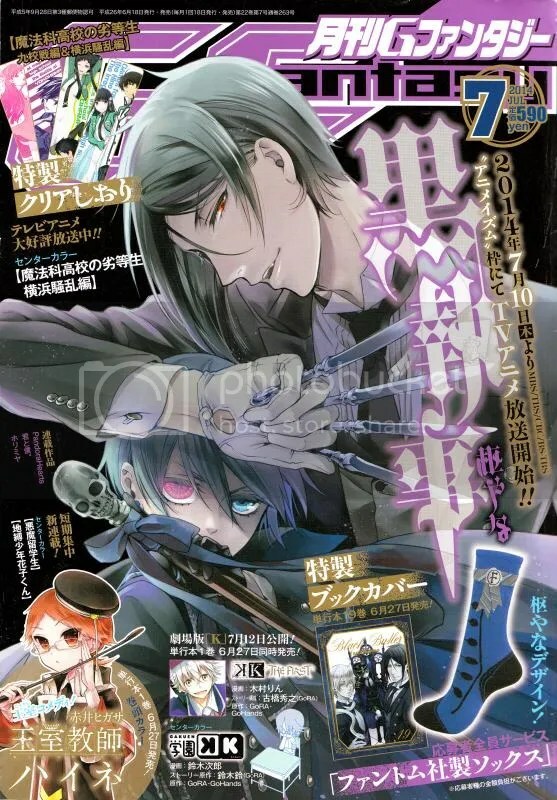 Sebastian and Ciel on the cover of GFantasy’s July issue. Time for news of UraBoku! It’s back, back, back. After nearly a year long hiatus, the new chapter is out! I meant to share the latest snippets right after putting up 07-Ghost final chapter. Somehow, things got busier and I had to set it aside. But anyway, we won’t be having such problems this month. So, keep a look out for the newest teasers. This will become a regular feature, taking over the spot from 07-Ghost which had just ended. 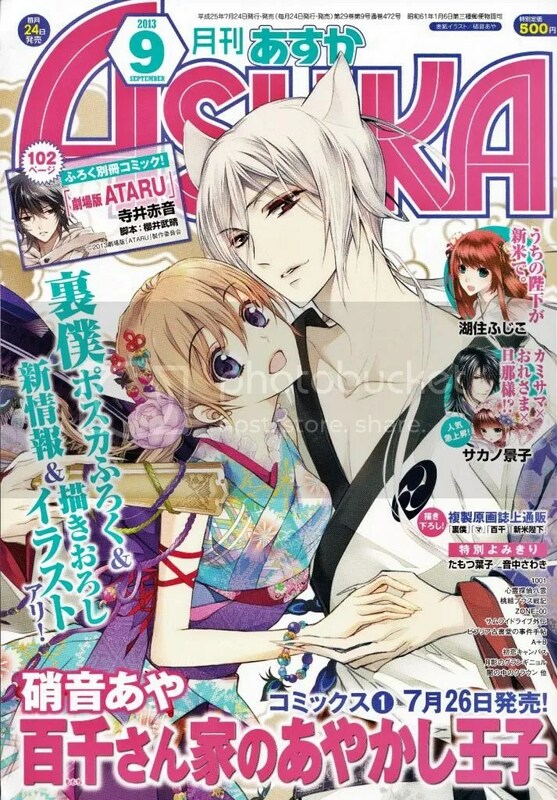 To celebrate UraBoku’s come back, Asuka featured the manga on it’s cover of the Oct issue. 07-Ghost Kapitel 99 (End) – The way to Seele is…. Hey all! How’s every one in the 07-G fandom doing? As you are all aware, the manga by Yuki Amemiya and Yukino Ichihara has officially ended its run of publication in the Oct 2013 issue of Comic ZeroSum. I’m sure quite a few people who had followed the manga still can’t believe that it’s ending. But yes, it is the end as some of you who have seen earlier spoilers of the final chapter at another site can confirmed. Thus, peeps of the fandom, this closure also means that it will be the last time I’ll post or share anything 07-Ghost. It has been a fun ride sharing the snippets with you all. I will miss the time of the month when I usually bring out the 07-G teasers. But before this post comes to a close, do check out the chapter teasers and my thoughts on it. Let’s get up to speed with some mag updates from the latest issue of 月刊 ASUKA. 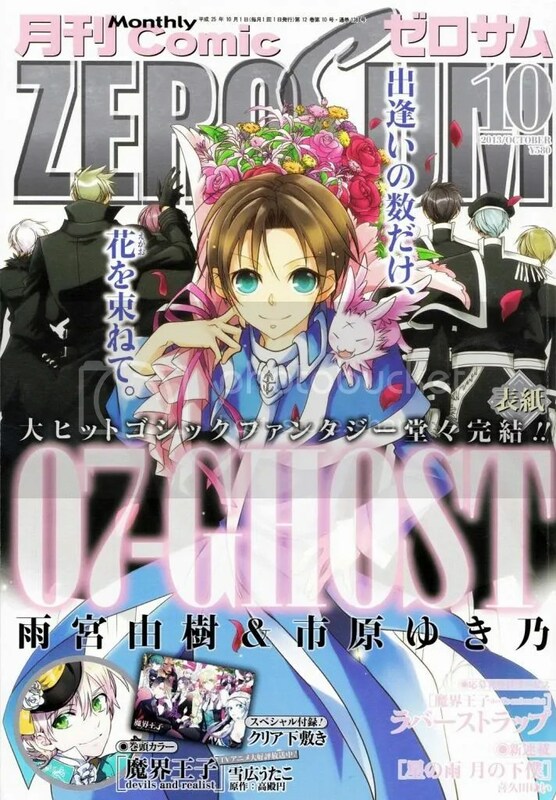 As I haven’t been posting magazine snippets of late, there had been some new titles that begun serialization recently. I’m sure there are some from the manga fandom that are on the look out for new stuff to read seeing as some popular titles have ended or are going to end soon. So, it is worth checking out what’s new, what’s still ongoing or is on hiatus and what’s upcoming. 07-Ghost Kapitel 98 is the penultimate chapter! Yes ◕‿◕ it is official. 07-Ghost is finally coming to an end. The last chapter will be out in the October issue of Comic Zero-Sum. With the penultimate Chapter 98, things seemed to be wrapping up a notch faster than most in the fandom had speculated or anticipated (with some still in denial). I knew the end is nigh and reckon the manga would end before the year is over. So, that announcement just sort of speaks for itself. More views and chapter snippets beyond the cut! Anyway, here are some teasers and volume snippets to satiate your UraBoku cravings until the new chapter dawns upon the fandom at large.